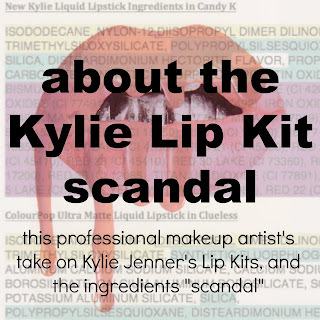 Beauty Blog by Angela Woodward: What do you think about the Kylie Lip Kit accusations? 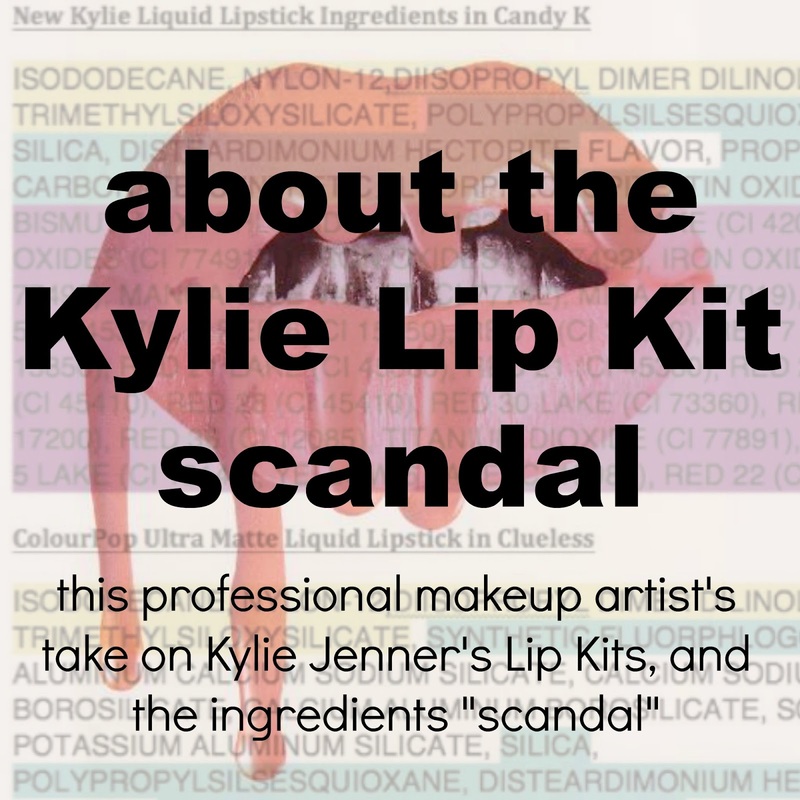 What do you think about the Kylie Lip Kit accusations? "Recently a lot of news outlets have been freaking out, because apparently Kylie's Lips Kits are the exact same ingredients as Colour Pop's and NYX's. But Kylie's cost almost $30 compared to the $6 and $7 price tags of the other two.... What do you think about this?" So I am going to start by saying - I haven't tried Colour Pop's yet. They are in the mail, and I am excited to try a few, but I haven't just yet. However I have tried the NYX Liquid Lipstick and the Kylie Lip Kit. If you check out my post Which Liquid Lipstick Is Best you will see a direct comparison of the two as well as three other popular brands. UPDATE: I HAVE tried the Colour Pop Liquid Lipstick Here is my direct comparison post! Now for a little story. I hate Miracle Whip, but I love Best Foods Real Mayonnaise. I will only eat Best Foods Mayo and once in awhile a batch will be too "miracle whippy" and I will buy a new one. Miracle Whip and Mayonnaise share over %50 of the same ingredients. In fact the products (that have about 10 ingredients each) the first four ingredients (40% of the ingredients) are the exact same! But I love one and hate the other. Why? Because those last ingredients make a big difference. Here is the thing, order REALLY matters! Just like with my mayo and miracle whip, a few ingredients being different makes a big difference! 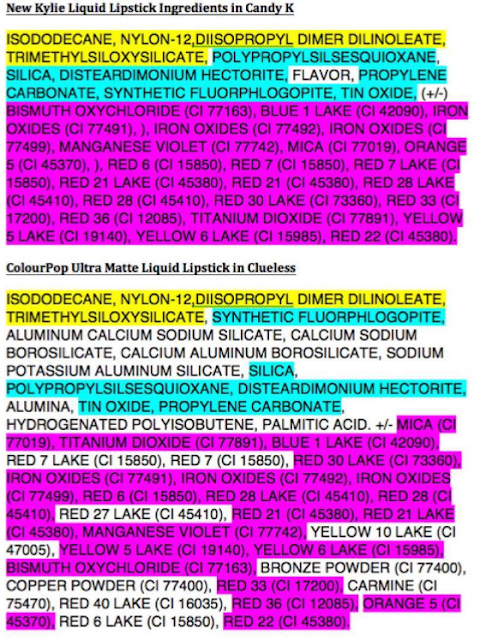 On top of that there is only 1 ingredient that the Kylie Lip Kit has that the Colour Pop does not use, while Colour Pop's is full of other ingredients, most of which are cheap fillers that dilute the product making it less potent. Usually high end products have the same ingredients as lower ends brands, but without all of the cheap fillers and stuff. Here is the other thing, I have used the Kylie Lip Kit, with this formulation (yes I checked) and the consistency and wear of this one vs the nyx is TOTALLY different. The Kylie Lip Kit is unique, because it has a very watery consistency where everything else I have tried (the nyx, tarte, ABH, Ofra and others) are all creamy. However even though it feels watery when putting it on, that allows you to use very little, and it is still really pigmented. It also causes the liquid lippy to create a thin layer of color as opposed to a heavy one which helps in the long lasting wear and kissability of the product. I have now tried the Colour Pop Liquid Lipsticks, and while I DO think it matches the Kylie Lip Kit in pigmentation and texture, it doesn't seem to last as long and it harder to take off. Worst of all the transfer rate is horrible! You can read my in depth results and thoughts here!